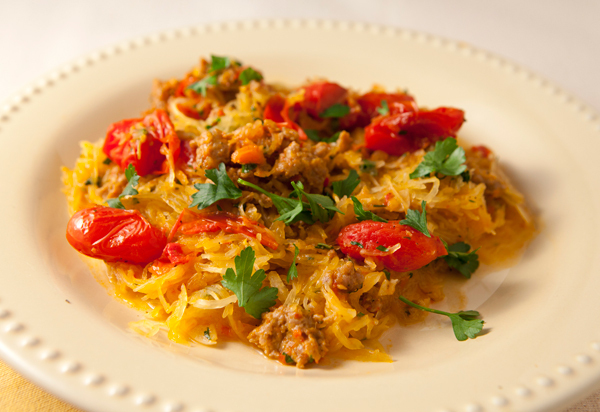 I think spaghetti squash is truly an amazing vegetable, and I love pulling the fork through it once it is cooked getting all those long “pasta looking” strands. Although I do enjoy cooking with it and eating it, I do not agree with some folks who state it has the texture of real spaghetti, and obviously, those folks mustn’t eat a lot of well cooked pasta dishes. 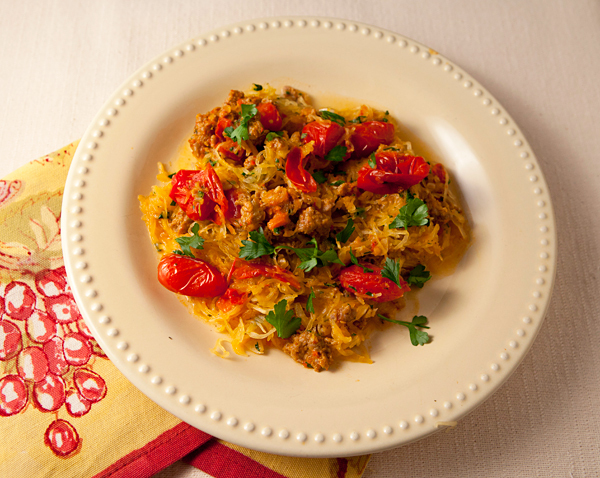 I was in the mood for spaghetti squash recently, and although I usually prepare it simply with a fresh tomato sauce on top, I decided to toss it with some oven roasted tomatoes, and sautéed spicy turkey sausages for something different. I added a bunch of chopped fresh herbs and it was a hearty, full flavored main dish for dinner that I finished off with a big crunchy mixed salad. If you prefer, you could simply use mild sausages instead of the spicy variety, but I found they added a lot of flavor to the dish. Winter squash is an excellent source of vitamin A. But that’s not all; there are significant amounts of vitamin C, E, K, B6, folate and thiamin. Turkey sausage is much leaner than pork reducing fat calories in this dish. Toss the tomatoes with two tablespoons of olive oil, and place in a casserole dish in the oven. Cut the squash down the middle lengthwise, and scoop out the seeds and loose strands of flesh. Lightly oil a baking sheet, and place the squash cut side down on the pan. Cook the squash until it is fork tender, about 35 to 40 minutes. In a frying pan, heat the remaining two tablespoons olive oil and cook the turkey sausage meat, breaking it up with two forks as it cooks, until it is lightly browned. Add the garlic and cook another couple of minutes until it is fragrant. Add the wine, and cook over medium heat until the wine has reduced by half. Once the squash has cooked, use a fork to pull the strands away from the shells and place in the pan with the turkey. Add the roasted tomatoes and fresh chopped herbs, and toss to mix well.